Abhijit Kumar Pathak born in 1986 in Bihar, passed his bachelor’s degree in painting from Banaras Hindu University and master’s from Jamia Milia Islamia in Delhi. He learnt to play tabla and has a diploma in music. The versatile artist’s work likes to experiment and draws his inspiration mainly from indigenous sources. Using a range of techniques, colours and media his work also includes worldly visual elements, incidents, issues and imageries. 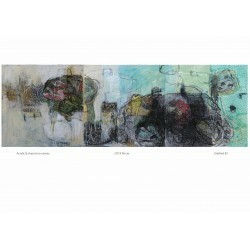 His work has been oart of many exhibtions some solo others group shows held in Varanasi, Delhi, Kolkata, Bhubaneshwar, Bombay, Lucknow, Pune, Nagpur and jharkhand besides in London. 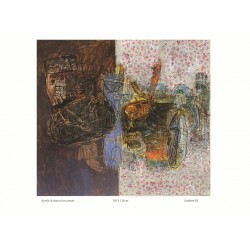 Abhijit’s work has won him many awards including the AIFACS, Bombay Art Society and lalit Kala Akademi from where it has found its way into private and corporate collections. The artist lives and works in Delhi.